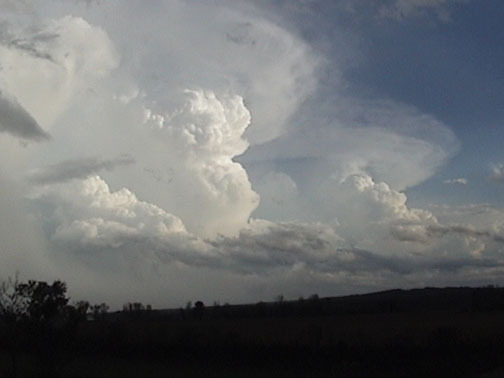 A significant cluster of supercell storms developed this afternoon over the Ozarks of Missouri and northern Arkansas. I headed out to intercept some of the storms as they crossed the Mississippi River into Illinois to the southeast of St. Louis. The day’s setup was as follows: A warm front was trying, mostly unsuccessfully, to move N thru STL area. The front had progressed slowly north during the previous night and morning, and was progged to reach about the St. Louis area, but in fact it never got that far north. Lots of rain and elevated thunderstorms had drenched the area the night before and that morning, due to overrunning moisture north of the warm front. This had now moved off to the north, and Edwardsville remained cloudy and cool. 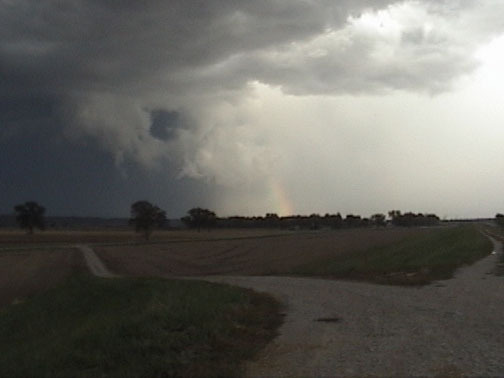 A low pressure center and a dryline trailing to its south were approaching from the SW through the MO Ozarks. 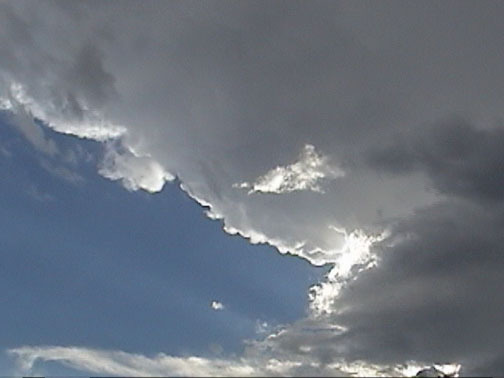 Shear was very good, with southeast winds at the surface ahead of the dryline and strong westerly upper winds. A red box was issued by mid-afternoon for E-central and SE MO and SW IL, valid until 6:00 p.m. Supercells began to fire to the SW of the STL area between 3 and 3:30 p.m.
3:30 – Out the door. I would head south and try to intercept the storms somewhere in Randolph County, about 50 miles to my south. It remains cloudy and cool, with a low stratus deck and haze. 4:00 – Around Columbia, IL, I begin to break out of the stratus. The wind shifts from NE, as it has been all day in Edwardsville, to SE, and the temperature is noticeably warmer. I am now under anvils from storms to my W and SW. When I left home, the movement of the storms was to the ENE at 35-45 mph, paralleling the general direction of movement of the low pressure center and dryline. However, this movement was soon to change, making my chase more difficult. 4:45 – I am wandering around SW. of Red Bud, somewhat confused about what to do. The storms are still well to my west, but the northward component on their movement seems to be gone, and it is looking less and less like I can get on the southeast side of any but the northernmost storms. A little after 5 – I am now heading west to intercept storms near Prairie du Rocher. These would be the storms toward the northern end of the cluster, the only ones that now seem reachable. At first, the storms are not looking too impressive to my W, but as I go they look better – there now appears to be an east-west line of storms to my N (tail-end supercell to NW?) and a rather rain-obscured supercell to SW. I hear tornado warning on this; want to intercept but doubt I can from N. From my viewpoint, this storm is very rain-wrapped. Although I did not fully understand this at the time, later review of radar shows that there were 3 discrete storms lined up more or less E-W to my north, with the strongest storm of the cluster being the one to my SW. All of the storms showed supercell characteristics, and remained discrete throughout the period of my chase. However, a lot of the structure was obscured by rain as well as the less-than-ideal terrain I was in, so all I could tell was that there was a line of storms to my north and what looked like an impressive but unreachable storm to my SW.
5:30 (approx) – from Prairie du Rocher levee (near fort), I am looking NE and NW at 2 supercells. I believe after reviewing radar loops that the one to my NE was the middle of the three in the line to my north, and the one to the NW was the westernmost. One of these, most likely the one to the NE, is SVR-warned and produces hail at Olympian Village, MO. 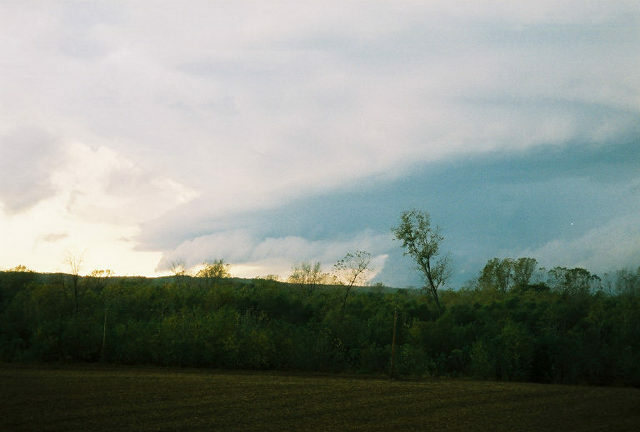 It does produce a poorly-organized wall cloud that nonetheless reaches very close to the ground. However, the one to the NW, though actually not as strong a storm, has more impressive structure, with a wall cloud and a curved updraft base ahead of it, and also lots of CG-probably more than the NE storm. 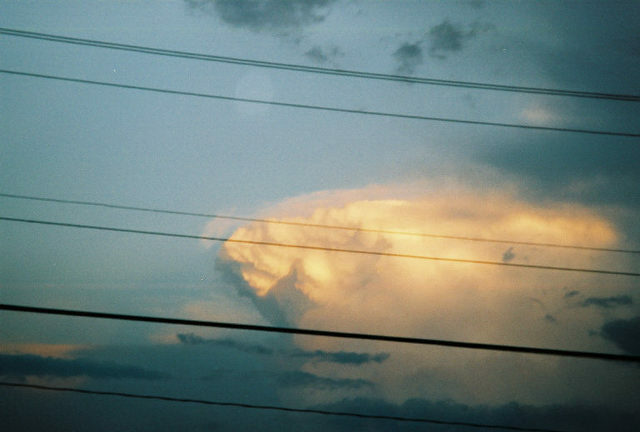 The NW storm also had a very impressive anvil overhanging me, as the strong upper winds blew it downshear. The supercell to my S. also remains severe and tornado-warned, and looked impressive. However, it is too far away and, as far as seeing any base structure, is too rain-wrapped for an intercept from the north. The river also presents a problem, as the best part of the storm is still in Missouri, and crossings are few and far between. The northern part of this storm, or perhaps another storm in the cluster closer to my SE, did provide a nice rainbow photo opp, however. After I’ve been watching the cell to my NW for maybe 10-15 minutes, I realize that it has now turned to the SE, and the chaser now becomes the chased. This turn had probably occurred earlier, as the radar shows that virtually all of the storms except a couple on the leading edge of the cluster (including the easternmost of the 3 to the north of me) had made a turn to the SE by around 5 p.m. The NW storm now chases me down the river road through Modoc to IL route 3. I stop to look and get overtaken a time or two – it was striking how fast the storm was now advancing on me, as I had no viable route for a distance except to move SE on the river road ahead of the storm as best I could. This picture was taken from the edge of Prairie du Rocher, during the early part of this process. 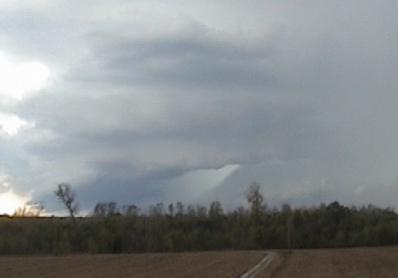 As the preceding picture shows, the storm developed a nice wall cloud, with the storm structure suggesting strong mid-level rotation from around 5:30-6:00. As I head SE on river road, wall cloud disappears in surging rain, but when I can get ahead of storm, I see it again. 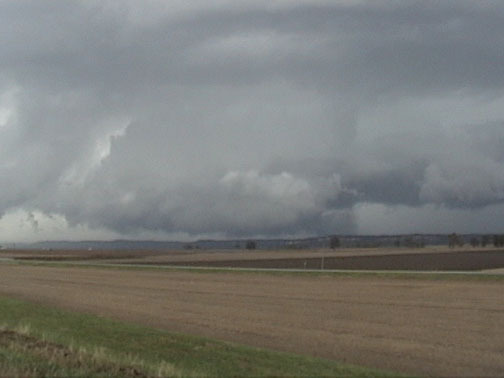 Much of the time it has an interesting inflow structure on SW side. I get a little small hail SE of Modoc, with blinding, wind-driven rain and close CGs. Radar analysis indicates that the storm strengthened around this time, though this cell probably never reached severe limits and was not as strong as either the one to its east or the tornado-warned one to my south. When I get to route 3, maybe around 6 p.m., I give up and go left to get out of storm, as it has continued to bear down on me, and I can’t get ahead of it or into good viewing position due to SE movement and river blocking any SW-ward move on my part. I see nice tower with storm to east while eating dinner around 6:20 in Chester. I got a nice picture of it, which would have been a great picture were it not for the wires that were there. It appears that the storm to my SW, which I never could get in position to intercept, is the one had earlier produced a tornado near Potosi, MO and later produced a long-track tornado south of Carbondale. This storm appears on the radar loop to have briefly weakened and reorganized about the time it passed over the Mississippi River somewhere near or south of Chester; this was definitely the strongest and most persistent of the storms over Missouri and Illinois. The storms I viewed near Prairie du Rocher, like most of the others in the cluster, were not as persistent as the southern storm, but virtually all of the storms showed some indication of rotation, which can be seen on velocity images during the time I was chasing. 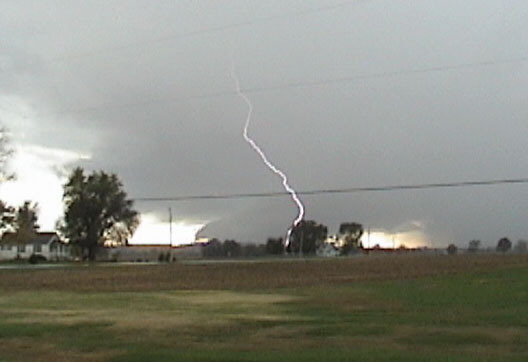 Although I missed the tornadoes, this still made for a pretty good chase for October in southern Illinois. An interesting point - on the way home, although I initially had a nice view of elevated severe storms in Macoupin and Montgomery counties that developed late in the afternoon north of the front, I was once again back under the stratus by the time I got a little way into St. Clair Co. From there north, the low stratus never did give way, as the front never made it north into the St. Louis metro area.